This easy broccoli white cheddar soup is warm, filling, and ready in under an hour! The perfect soup recipe for chilly evenings. Vegetarian. THIS SOUP. Let’s talk about it. This is another updated recipe from wayyyyyy on back in the blog archives – but since it’s still one of my most favorite soup recipes, I decided it needed a well-deserved upgrade to some new photos and a prime place on the front page of the site. 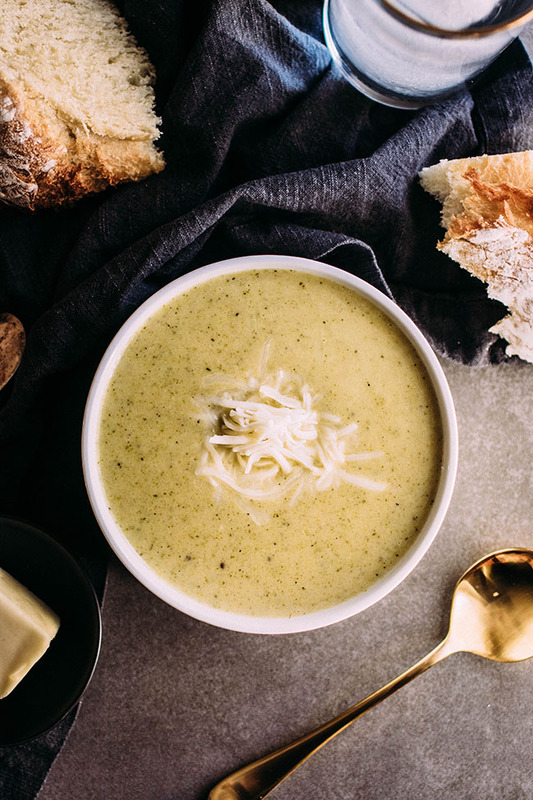 I present to youuuuu (ermm…again) the easiest, most delicious white cheddar broccoli soup of all time. 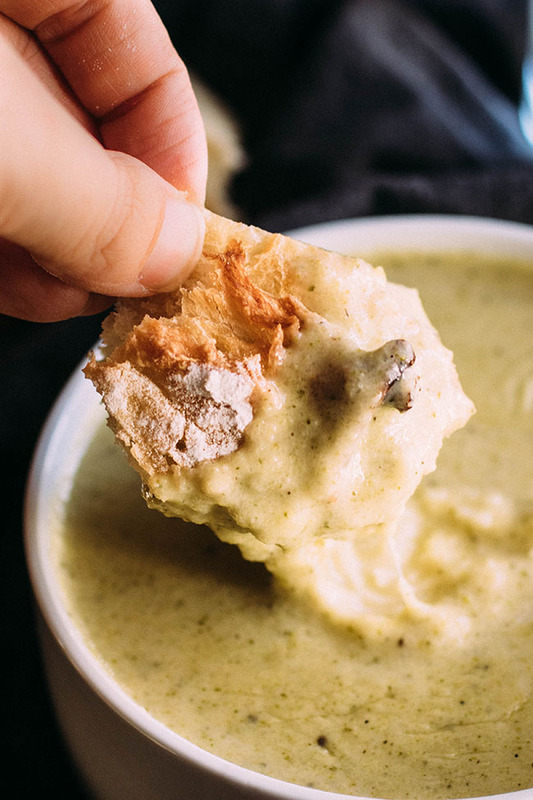 This broccoli white cheddar soup (say that ten times fast!) is comfort food at its finest, which is exactly what I need when it is cold and yucky outside. It’s been snowing NON. STOP. here for the past few days, and while I’ve acclimated a teensy bit to living in cold, snowy places after a childhood spent on the West Coast (#BestCoast), I really only have a few hours of snowy tolerance in me before I’m…umm… OVER IT. Thankfully, snow outside = soup for dinner. At least in my house. This soup is ready in under an hour, which to me is the perfect balance of time for warming up over a simmering pot of happiness on the stove but still having a quick and easy dinner situation. It’s also free of any butter or heavy cream (only veggie stock and skim milk here, folks!) so you can feel good about eating it as part of a healthy diet serving it with ten extra pieces of this Easy Crusty French Bread. PS – If you want to be my soup hero, you’ll serve this broccoli white cheddar soup in these sweet wheat bread bowls. Because OMG. 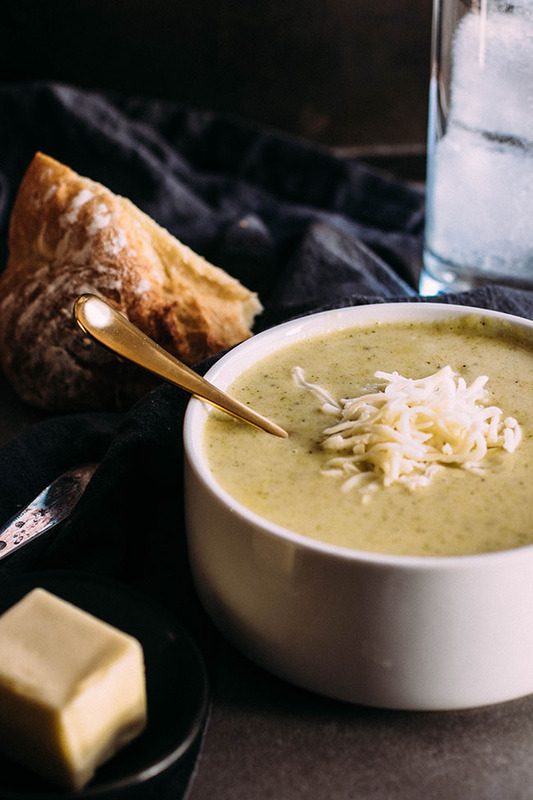 Simple broccoli white cheddar soup – perfect for chilly evenings. Add onion, garlic, salt and pepper, and saute until onions are translucent, about 3 minutes. Add flour to saucepan and stir until flour has soaked up all the moisture. Cook for 1 minute. Add stock a little at a time, mixing the soup thoroughly to incorporate all ingredients and work out any flour-onion-garlic lumps that may have formed. Bring mixture to a simmer and add broccoli. Simmer over medium heat until soup has thickened slightly, about 10-15 minutes. Return soup to heat and simmer another 5 minutes or until soup has reached a “soup-y” consistency. Remove soup from heat and stir in shredded white cheddar cheese. Stir until all cheese is melted. Ladle into bowls (or bread bowls! ), garnish with extra shredded cheddar cheese, and serve immediately. If your cheese separates when you stir it into the soup, blend it with an immersion blender to bring it back to the right consistency. For a chunkier soup, feel free to skip or shorten the immersion blender phase or to stir in some additional chopped broccoli after you’ve blended the soup. Serve this soup with my Easy Crusty French Bread! PS – I recently updated the photos for this recipe to make it look a lil’ nicer, so don’t be worried if it looks a bit different! The recipe is exactly the same, and still a favorite in our house. Yes, the flour is used for thickening – you can definitely use corn starch (or add extra broccoli/onions or reduce the stock by a bit to help it thicken up more!) I don’t have a great garlic parmesan sauce recipe yet, but I’ll definitely add it to the to-do list! We’re working on a HUGE pizza series right now so that’s perfect timing. I was led to this recipe while searching for information on using an immersion blender (I received one for Christmas 2017). I tried it last night and oh boy, is it delicious! My husband and I ate the whole batch. I used frozen broccoli but will try fresh next time; I can’t imagine it being any better though! Thanks for sharing! I’m so happy you liked it, Joyce! Thanks for letting me know how it turned out (and I hope you’re loving the new immersion blender! One of my very favorite kitchen tools). Hi, I just discovered your blog and really enjoy it so far. This recipe sounds very good, but I was curious if you could recommend a protein to add to make it a bit more filling? I’m not sure if chicken or sausage would compliment it. I don’t know that I would personally put a protein into the soup itself (I just love the creamy texture on its own), but we frequently serve this soup alongside some roasted or grilled Polish Sausage and that combination is always a hit! 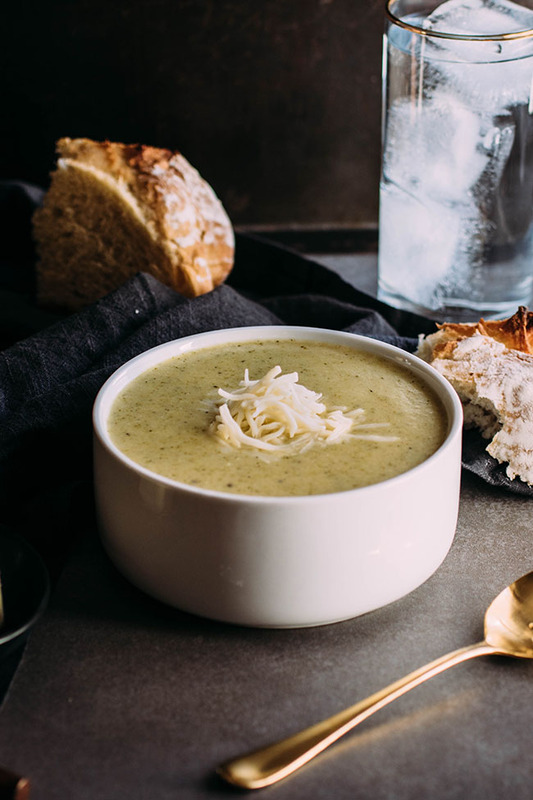 We also love a bowl of this soup with a simple salad on the side, a grilled cheese sandwich, or with plenty of fresh bread. I have one word for you: bacon. Cook some up beforehand and saute those veggies in the resulting grease, then crumble about four strips into the soup after you do the blending. This gives you that creamy soup with little chunks of bacon here and there. Primo! This was very tasty, followed exactly what you said, good job. Thanks, Robbie! I’m so glad you liked it! OH my this soup is SOOO amazing!!! This is definitely a keeper in my recipe book! My only problem was that I couldn’t find any white cheddar so I had to use regular cheddar 🙁 Where can I find white cheddar and does it make a difference? Thank you – I’m so glad you liked it! No worries at all about using regular cheddar cheese – I do it all the time! I like to use White Cheddar just because it’s something a little bit different, but the end result honestly doesn’t taste too terribly different. My grocery store (Wegman’s) carries white cheddar in big blocks, but I’ve also seen it at Costco, BJ’s, and Whole Foods! If I ever can’t find something, I just ask someone at the store – usually, even if they don’t carry what I’m looking for, they can tell me another local store that does have it! I had the same question…I’m not sure if cooking fresh broccoli for ten mins would be enough? I always make this recipe with fresh broccoli! Cooking it right in the broth for 10-15 minutes as directed is usually plenty of time to soften it up enough for the immersion blender, but you can certainly let the soup simmer a bit longer if you’d like to give it some extra cooking time. Hope that helps! This was FANTASTIC! 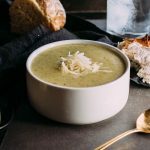 I have been looking for a non-cream, non-blending broccoli cheddar soup for two years! This one was quick, easy and delicious. Not to mention I felt much better about eating eat because it uses skim milk instead of cream (so it’s “light,” right?) 😀 Thank you thank you! I’m so happy to hear you liked it! Thanks for letting me know! I found this recipe on Pinterest. Just wanted to tell you that it is SO flipping good. My pregnant self ate the whole recipe (minus the few bites I allowed my boyfriend to have). Very easy to make, which is exactly what I was looking for! I’m so glad you liked it! This is hands-down my favorite soup. Thanks for letting me know how it turned out! I couldn’t find white cheddar cheese and Walmart or smith’s. Would Monterey work or would you suggest just a yellow cheddar? I would say just use a sharp yellow cheddar! If you can, buy a block of cheese and shred it yourself (rather than pre-shredded in bags) because pre-shredded cheese can contain preservatives that prevent it from melting smoothly. Hope that helps! Thanks, excited to try it tonight. And I totally agree with you on buying block cheese. I don’t think I can ever go back to pre-shredded bagged cheese!